North Coast Village condominium, beach resort home in Southern California. This two bedroom / two bath Oceanside condo features Luxury King Size Bed, Cable TV / DVD and large rooftop sun deck balcony with dining counter. North Coast Village is situated on-the-sand between the harbor and the pier and this property is located at the top on the third floor of Building B. The downstairs bedroom has 2 Deluxe Queen Size Beds. All linens provided throughout. The living room has a Queen Sleeper Sofa with gas fireplace, Cable TV / DVD, and a desk area with Secure FREE WIFI internet access. Port-a-Cribs are available by request in your reservation comments for additional $50 fee. Our fully equipped kitchen has all the essentials for preparing a quality meal, including cookware, cooking utensils, and a coffee maker. The dining table boasts plenty of seating for at least 6 to enjoy dinner or family games! 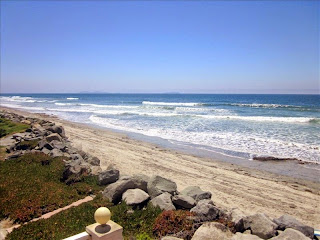 North Coast Village Condo Rental in Oceanside CA..